Earlier this week I noticed a strange thing in my letterbox. An actual handwritten letter – from an unfamiliar address. Expecting a Christmas card from one of the few friends who haven’t discarded this charming tradition for a digital greeting, I ripped open the envelope. Inside was a short note and a newspaper clipping – from the step-mum of a girl I went to high school with 18 years ago. Strange huh? But moments later tears pricked my eyes as I read her beautiful words – encouraging me to keep speaking up about mental illness. She also mentioned that I might be interested in a new children’s picture book she’d read about in the local paper: My Happy Sad Mummy. I quickly read the book review and then jumped online to order our family a copy. For so long I’ve been searching for ways to explain my Bipolar Disorder to my young children in a way that’s easy for them to understand and doesn’t scare them. Well, my copy of My Happy Sad Mummy arrived today and it’s fantastic. Using beautiful illustrations, it tells the story of a young girl living with a mother who experiences manic and depressive episodes. 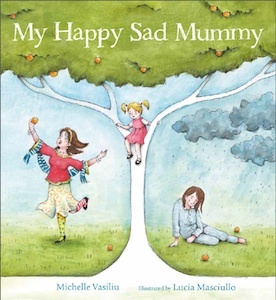 The author, Michelle Vasiliu draws from her own experience of Bipolar Disorder, to portray the emotional rollercoaster of this illness, as a young child might perceive it. 1. It doesn’t mention the label ‘Bipolar Disorder’. I don’t fancy my chatty five year old talking about my diagnosis with kinder teachers, school friends and other random strangers in the supermarket check-out queue. 2. It emphasises the strong bond of love between the child and her mum. Despite having days when her mum struggles to get out of bed, or is caught up in manic activity, there’s no doubt in the child’s mind that her mum loves her. 3. It’s really engaging for young children. I’m planning on reading this story to my 3, 5 and 7 year old children every few months – gradually introducing the idea that they have a ‘Happy Sad Mummy’ too. My older children know I take “brain medicine” every day – this will be a nice way of explaining why I need to take it. 4. It’s an example of a Bipolar mum using a painful experience to help others. Michelle’s motivation for writing the story came about after she had experienced a crisis: being admitted to a psychiatric hospital in 2007. At the time, her children were three and six and Michelle wanted to alleviate their fears about what was happening. Now, she’s trying to help other mums who find themselves in the same situation. If any of you are like me – and struggle to find the right words when talking to your children about your illness – why not check out this new book. Can you recommend any other picture books that can help mums to explain Bipolar Disorder to young children? Got any other tips for other ways to talk about this with children? Would love you to share them with us. Posted on December 3, 2014 by mariskameldrum •	This entry was posted in Motherhood and tagged children, motherhood, resources. Bookmark the permalink. I will have to purchase this book. My children are 1 and almost 3 so they are young enough to not quite notice. Though the almost 3 yr old is starting to notice. I saw this post on Twitter and had to share. I struggled with how to one day explain what it the matter with mommy to my boys. Right now Pickle is 1 and Big D will be 3 next month. So I have manged to skate by. However my every observant Big D, it starting to notice things are sometimes off. He now asks ‘What is wrong, Mama?” I think this book would be a great way of explaining things on his level. I like the idea of having it at the ready too – in case I’m ever acutely unwell and have to go to stay in a psychiatric ward. I know I’d be too unwell to organise something like this then, but it would be reassuring to know that my hubby would have something on hand to help explain the situation to the kids and allow them to talk about how they are feeling (scared, confused etc.) At such a young age, they’re pretty accepting of things – but I’d hate to think they were feeling confused or upset and didn’t know how to talk about it. Thank you! I have found a similar book in Norwegian that has helped me explain my situation to my 9 year old 🙂 CHildren books that put it into their perspective are awesome and so much help ❤ I will check out this book too, maybe its easy to translate it while reading 🙂 Thank you for sharing! Sounds like a great idea! I have a friend that lives in Norway – and her children are lucky enough to be bilingual now. Not many Aussie kids can speak two languages as you’ve got to jump on a plane to get to another country. Thankyou for your blog mariska. I am so pleased these things are now available.